Two of our litters celebrate Birthdays in december. Litter Have 8. birthday on 12.12. and Litter Be My already 12. birthdays on 15.12. Happy Birthdays to our girls Jilly - JCH Be My X-mas Angel Brdské zlato and Fergie - CH CZ Have More Fun Brdské zlato and all their siblings! 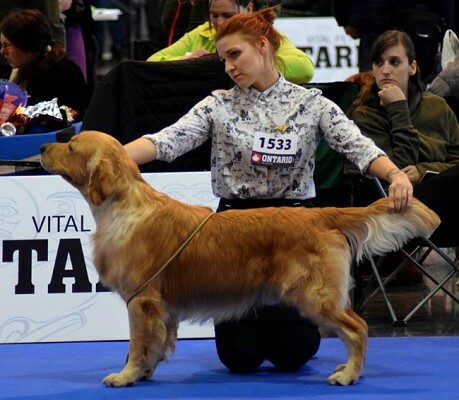 Our dogs and many of their progeny were presented at International dog show in Prague. Many thanks to everybody for nice presentation and congratulations to all results! It was first indoor dog show for our three youngest sisters and they were all doing great and presented themselves nicely. Roxy - U Are My Only One Brdské zlato was most succesfull this time and achieved VP and 2. place. Sisters Beretta - U Are My Beretta Brdské zlato and Eliška - U Are So Beautifull Brdské zlato got P. Eris - JCH Power of Sol Brdské zlato "U" and Finny - CZ Hunting CH Quantum of Joy Brdské zlato "U" competed together in working class. Both got Excellent and Eris nice 4. place. Pino - CZ CH Power of Love Brdské zlato achieved Excellent 2. place and r.CAC title. It´s long time from last update of our web page so we have a lot of news. 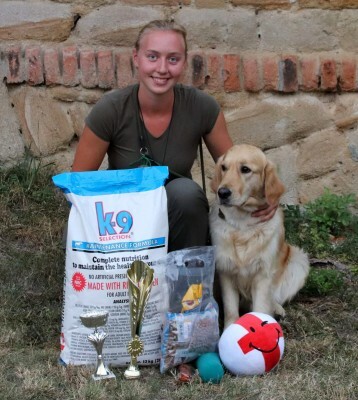 First place is for working news and for Finny - Quantum of Joy Brdské zlato "U" who won her last CACT title at PZ hunting test and so became Czech Hunting Champion in tender age only 3 years! Big congratulations we´re very proud of you! Rory - CZ Hunting CH Run and Retrieve Brdské zlato "U" and Maybe - DualCH CZ Make Right Decision Brdské zlato "U" competed at St. Venceslav Cup. Rory passed both days with II. price and Maybe I. price on Saturday and III. price on Sunday. Great day had Eris - JCH Power of Sol Brdské zlato "U" at KVZPR hunting test in Kařez. Eris worked excellent both days with great temperamentand so she deserved I. price, CACT title , judges choice Best field work and she also became Winner of the test! Big congratulations! 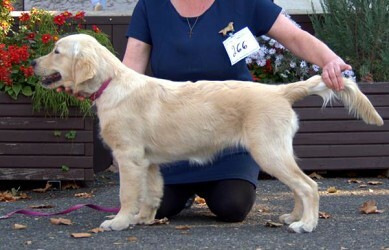 Our progeny was succesfull also at dog shows. 3 girls from our last litter were doing great at their first dog show. All got very nice critics and Very promising. Beretta - U Are My Beretta Brdské zlato won 1. place, Roxy - U Are My Only One Brdské zlato 3. place and Eliška - U Are So Beautifull Brdské zlato 4. place. Also Pino - CZ CH Power of Love Brdské zlato and Molly - Run And Play Brdské zlato were doing fine at this dog show. 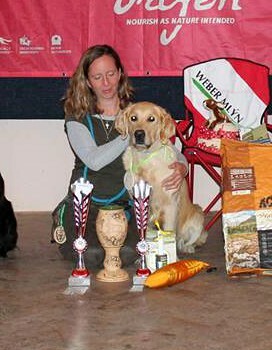 Pino was Regional Winner in males and Molly Regional Winner in females. 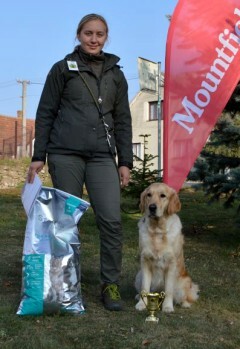 Molly and Pino also attended International dog show in Ceske Budejovice. 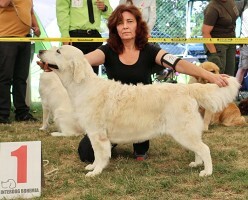 Pino won working class with CAC and so he became Czech Champion! Molly was Excellent 3. place in strong open class and Finny - Quantum of Joy Brdské zlato "U" VG4 in working class. Last but important news are about health. Eris - JCH Power of Sol Brdské zlato "U", Winnie´s - I´m Your Forever Brdské zlato "U", Pino - CZ CH Power of Love Brdské zlato and Molly - Run And Play Brdské zlato have all Clear Eyes! 25.-26.8.2018 We were for fifth time at our most prestigious hunting competition MSR this time with Rory - CZ Hunting CH Run and Retrieve Brdské zlato "U" . 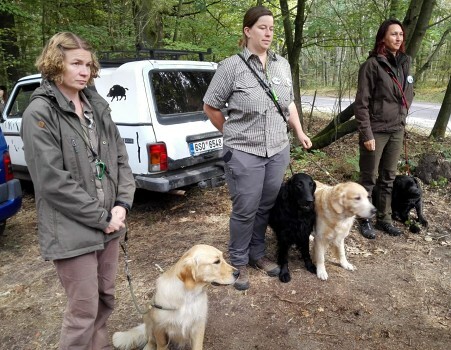 She´s probably youngest dog nominated ever and very short time after her first litter so not ideal condition but we didn´t want to miss this top hunting competition. Rory worked very well at field and water first day with excellent points. Second day in wood was a bit unlucky for us but we passed succesfully despite loosing points. 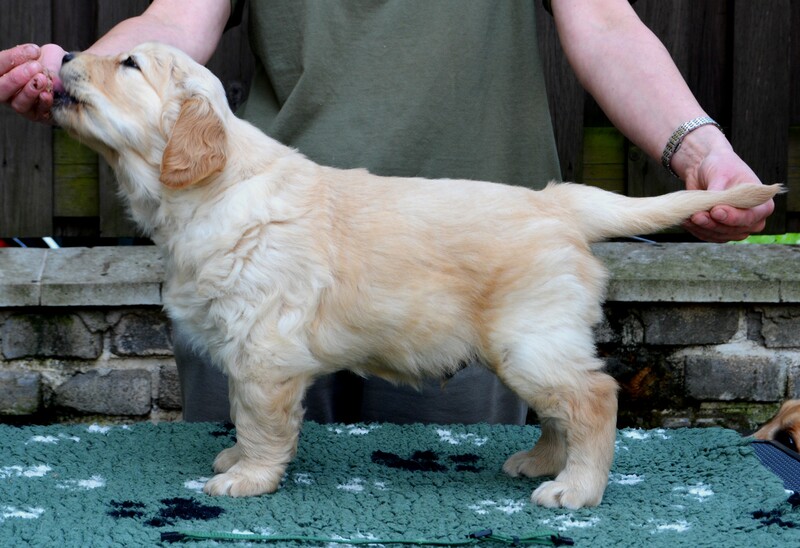 I´m very proud of my girl as she managed to pass so difficult test so young and so short time after her lovely litter! I´m also very proud of Finny - Quantum of Joy Brdské zlato "U" and grandson Enzo Golden Sirius who also passed this difficult test succefully and both are also very young - only 3 years. Big congratulations! 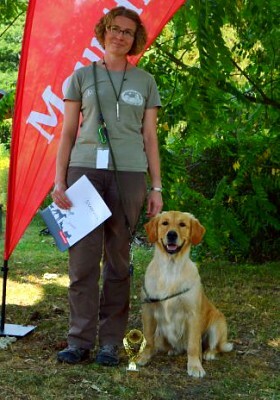 We were at PZ hunting test with Rory - Run and Retrieve Brdské zlato "U" on Saturday 18.8. It was held near our home and at nice place. We spent very nice day with friends despite very hot weather. Conditions were difficult for dogs so only 4 dogs out of 15 finished with I. price. Rory was one of them and gained lovely 3. place and as only GR (out of 10) with I. price gained also CACT title! This last CACT makes her also Czech Hunting Champion !!! My sweet girl achived this title only 2,5 years old and what´s more she managed to raise also litter of 8 beautifull puppies meanwhile! Thank you Darling! 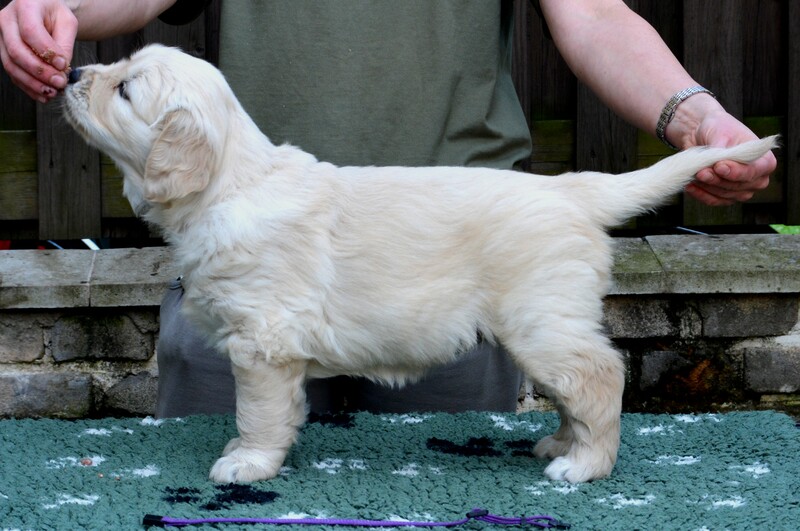 There is last available baby boy in kennel Staroveský poklad son of our Noreen - Northern Star Brdské zlato and Solstrimmans Serengeti. He´s cute little teddy-bear with cream coat. In case of interest please contact breeder - Radka Burdová - tel: +420 732 888 880 and email: radka@staroveskypoklad.cz . 4.8.-5.8.2018 - We were with Rory - Run and Retrieve Brdské zlato "U" at first hunting test shortly after her first litter. Her head was still full of puppies so first disciplines were not perfect but then she figered out we´re at hunting test again and worked very nice. First day we passed PZ hunting test with III. price in tropical weather. Second day was a bit better weather and we passed ZVP hunting test with I. price and lost one point only in one discipline. Also Finny - Quantum of Joy Brdské zlato "U" was with us at PZ hunting test on Saturday and she was doing great and gained I. price. It was very hot but very nice weekend with friends and dogs and we enjoyed it very much! Maybe - DualCH CZ Make Right Decision Brdské zlato made us proud one week earlier. He passed difficult KVZPR hunting test with II. price and so deserved "U" title! Big congratulations! Our Finny - Quantum of Joy Brdské zlato "U" was doing great with her young handler at difficult hunting test ZPR in Blevice. Finny worked excellent despite very very hot weather. This dream team gained I. price, full points in all disciplines and so deserved also CACT title and became Winners of all test! Big congratulations we are very proud of you! 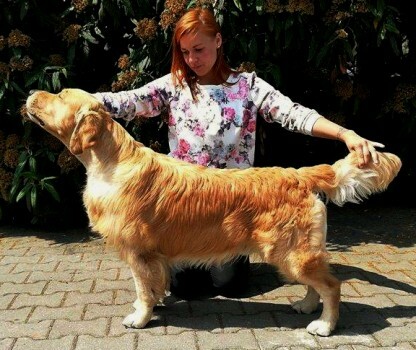 Owners of our progeny spent nice and hot day at National dog show in Mlada Boleslav. All were doing fine despite judge prefered cream colour. Pino - Power of Love Brdské zlato gained Excellent 2. place with r.CAC in open class, Molly - Run And Play Brdské zlato Excellent 3. place in strong female open class, Eris - JCH Power of Sol Brdské zlato Excellent 2. place, r.CAC in working class and Kaylee - CH CZ Energy Sun Brdské zlato won veteran class with Excellent. There was big parting with our puppies previous week. Only Uri - U Are My Hunter Brdské zlato is still with us and will leave to Austria on Saturday. 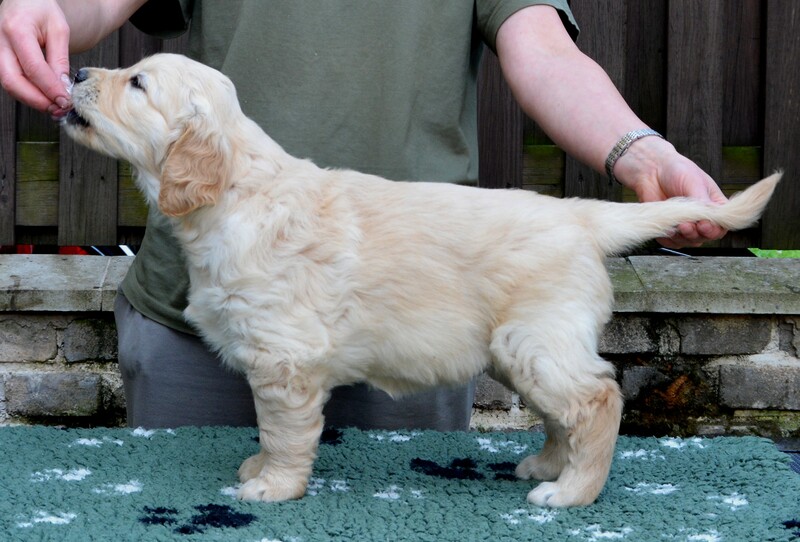 All puppies are doing fine in their new homes and we get nice news and pictures from new owners. Uri was few days also at our training camp with us and enjoyed it very much. He was in a middle of attention and was good and brave boy. He swimmed in big lake for the first time and loved it. Best week in all year passed also - our Traning camp in Roudná. 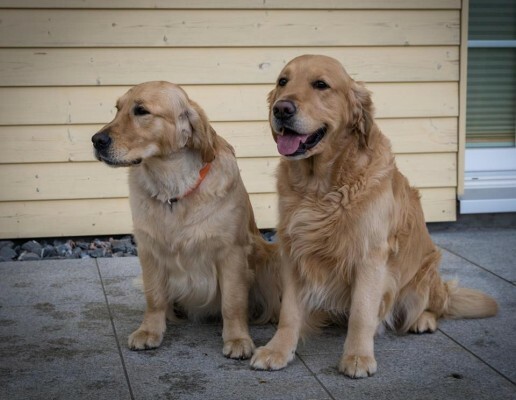 This year was just perfect and we enjoyed it so much with many good friends and our beloved goldens. All week was perfect relax and work with our dogs which they like so much. There was held Water hunting test in the end of the camp. Our progeny was doing fine. 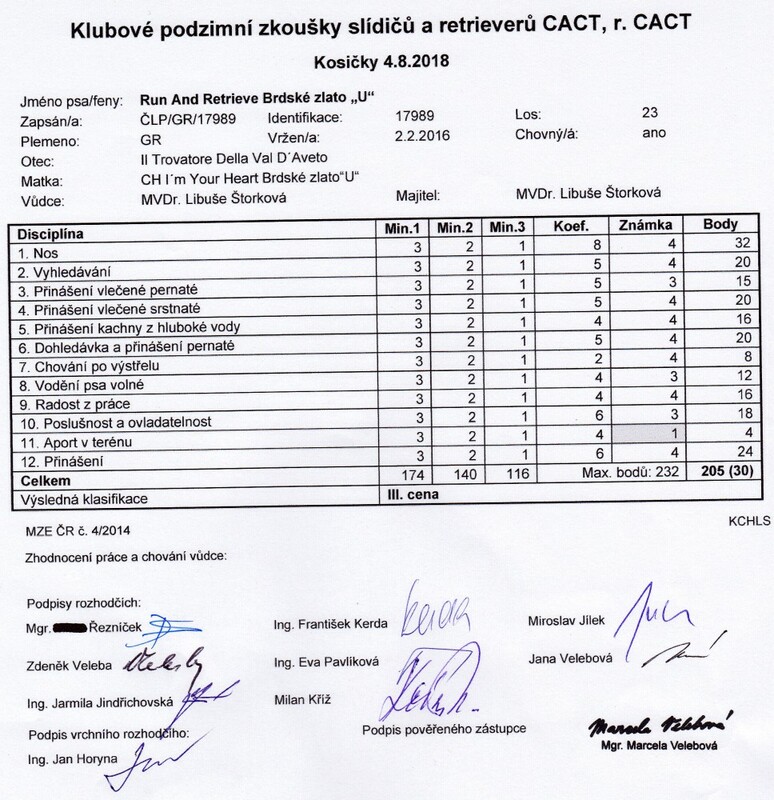 Pino - Power of Love Brdské zlato passed with I. price and great 3. place, his sister Eris - JCH Power of Sol Brdské zlato also with I. price and 4. place and succesfull was also Wendy´s granddaughter Vali - Amazing Love Staroveský poklad with II. price. Big congratulations to everybody and a lot of enthusiasm for next work! Big thanks to main organiser Irena Zárubová and also to all team of helpers and sponsors! We´re looking forward to next year very much already! 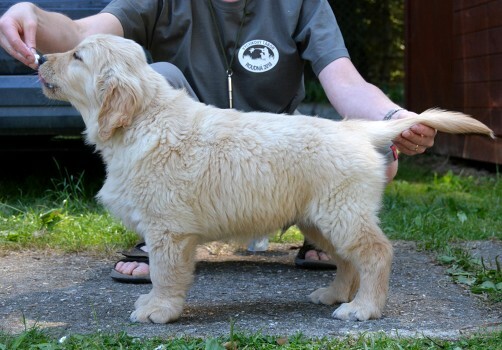 Our puppies are in new homes but there are some available babies in kennel Staroveský poklad. Mum is our Noreence - Northern Star Brdské zlato and father Solstrimmans Serengeti. 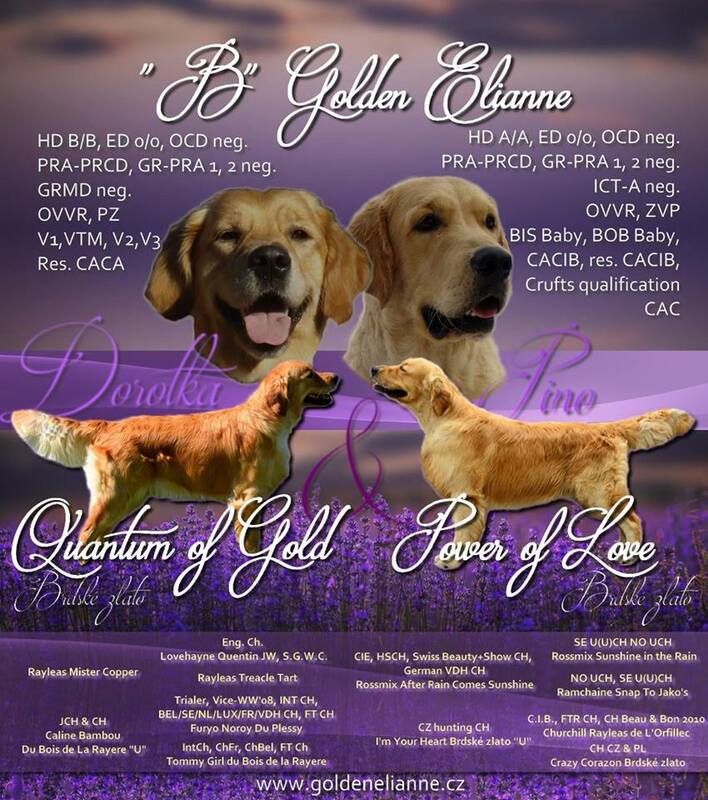 If you are interested contact breeder Radka Burdova: Phone no. +420 732 888 880 email: radka@staroveskypoklad.cz . Puppies are 6 weeks old and we´re a bit sad parting is getting near. Puppies got next deworming today. They got tablet as big dogs because their weight is actually about 6kg. Boys a bit more and girls a bit less. They are group of little cute rascals and they are very funny when playing together, with mummy and sometimes also with our other girls. 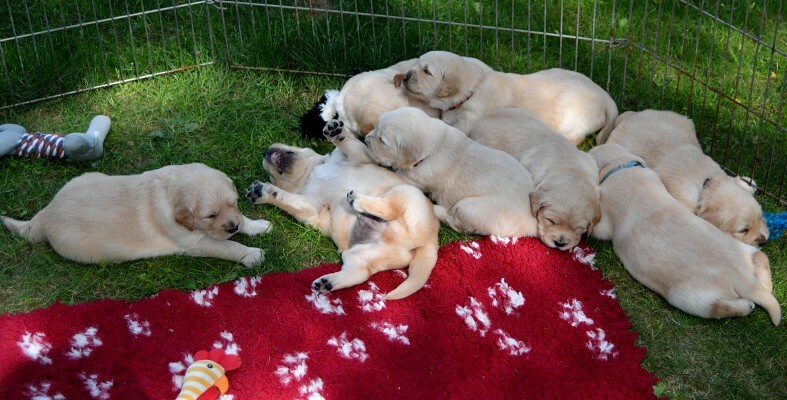 Puppies enjoy many visitors - future owner as well as our friends and family. We train traveling in car a bit and make little trips in our surrounding. If weather will remain hot we´ll visit lake soon and puppies will try to swimm for the first time. Our Puppies are growing very fast and are already 5 weeks old. It´s my favorit age as puppies are very cute, cuddly, playing nicely and not gang of destroyers yet :o) All litter is still very balanced. 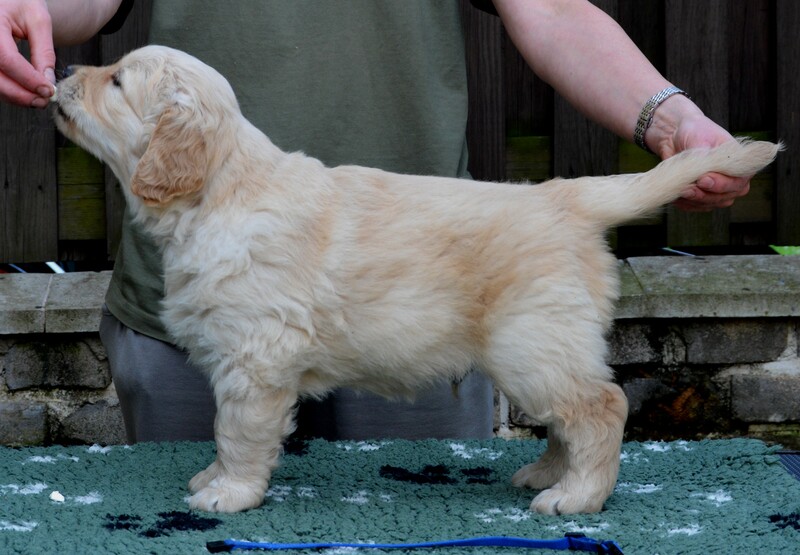 All puppies growing fine, all have very dark pigment and thick coats. Hot weather is not so fun for them but fortunately their room is cool and they can hide there during hot days. We had a lot of thunderstorm yesterday but puppies didn´t mind to play in rain and enjoyed little temperature drop. One reservation for baby boy was canceled for serious reasons so we´re looking for loving family for him! 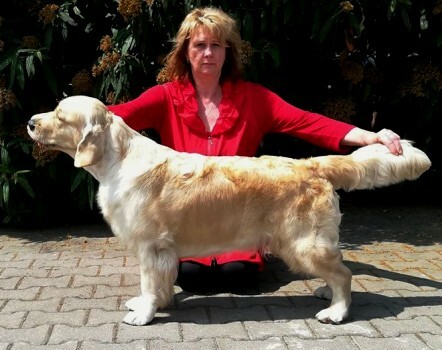 Sarah - DualCH Deep Desire Brdské zlato "U" finished her Veteran Champion title this Saturday. 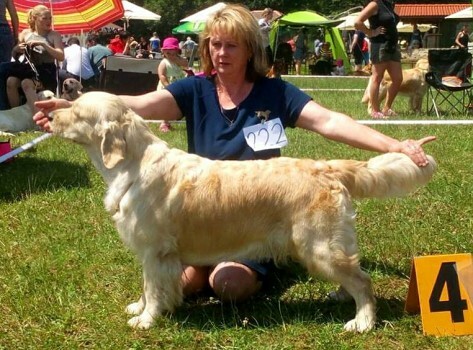 She presented herself nicely in veteran class despite very hot weather. Big congratulations! 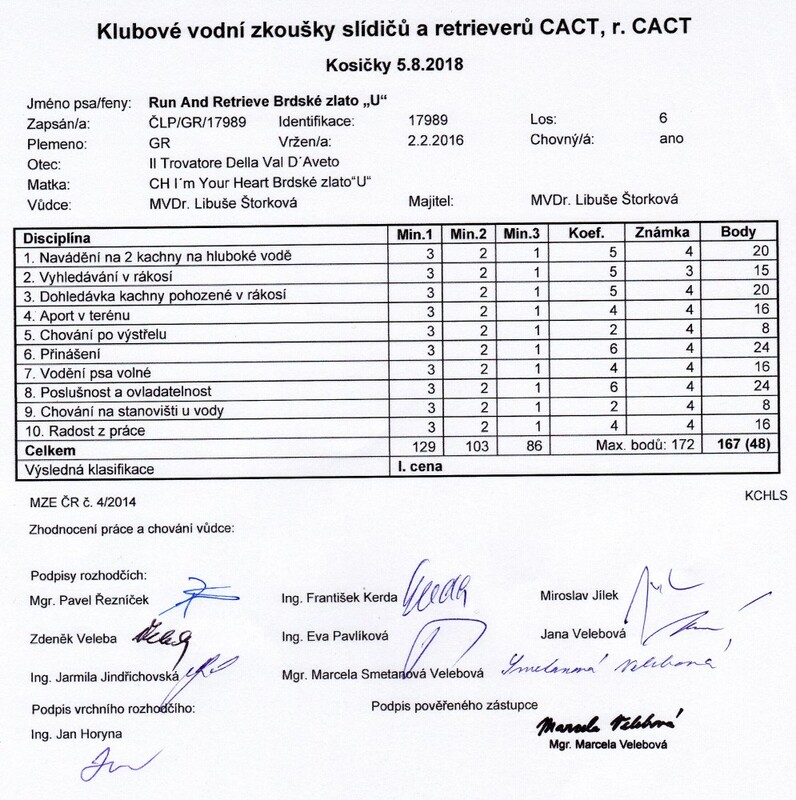 9.-10.6.2018 - Eris - JCH Power of Sol Brdské zlato was working all weekend and passed two hunting tests calles Podbrdsky Cup. She was doing great on Saturday and passed LZ hunting test with I. price and r.CACT title. She was a bit naughty on Sunday which is understandible in such hot weather and demanding hunting tests and passed ZVP hunting test with II. price. Big congratulations! 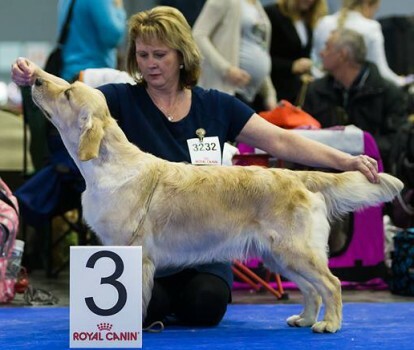 We got some awesome dog show news from our progeny. Lola - CH Let Me Love You Brdské zlato was doing great at dog show in Russia. 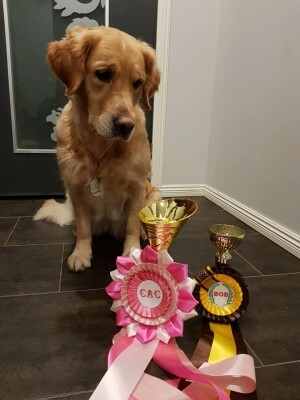 She won open class with CAC, then also BOB title and BIG3 in ring of honour! Biiig congratulations! Pino - Power of Love Brdské zlato and Molly - Run And Play Brdské zlato traveled to dog show in Poland together. Pino won his class with CWC and Molly was Excellent 2. place. Good job! 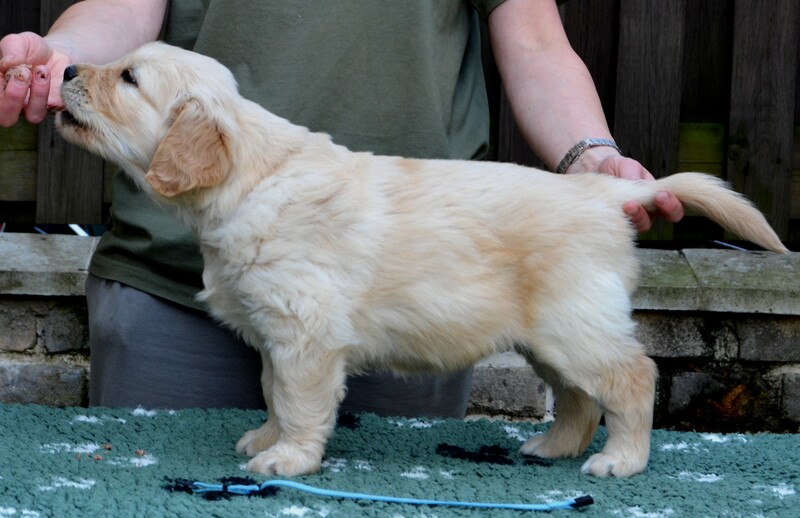 Next week passed quickly and our Puppies are 4 weeks old. We moved to new bigger place and puppies enjoy new room and new big outside area. They have also many many new toys now. Puppies got second deworming as well as mummy Rory. Rory has still lot of milk but puppies also enjoy raw meat three times in day. One reservation for boy was canceled so he is available for new loving family. 28.5.2018 - Our Puppies are 3 weeks old and developing very quickly. Puppies spend all days in our garden where hot weather is better bearable. Grass is also great for their movement so they improve quickly and walk nicely. Most active puppies already train to run and jump a bit :o) Puppies´s first teeth are coming out so they´ll get their first solid food very soon. 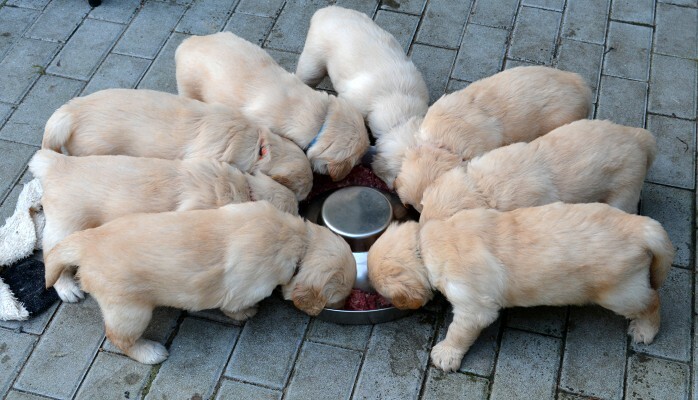 We´ll start with puppy milk and then quickly real meat. 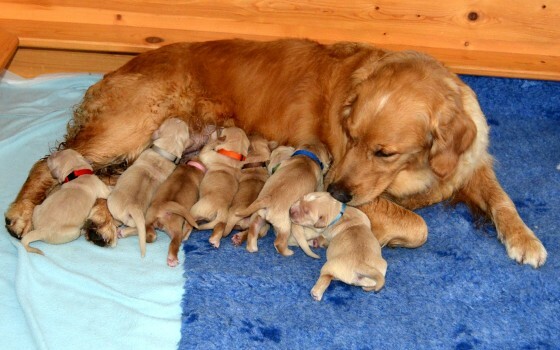 All puppies are very similar in look, size and weight. Pino - Power of Love Brdské zlato and Molly - Run And Play Brdské zlato were at Retriever Club Show in Chlumec and enjoyed their day out. Both were in strong and quality open classes and both got very nice judgement. Pino was Excellent and Molly Excellent 4. place. Congratulations! Our Litter Stay celebrates important first Birthday on 26.5.2018. We wish to all teetagers and also to their parents Bessy - Make My Day Brdské zlato and Fox - Power of Rain Brdské zlato great Birthday party and many many happy and healthy years with their families! Our Litter U is already 2 weeks old. 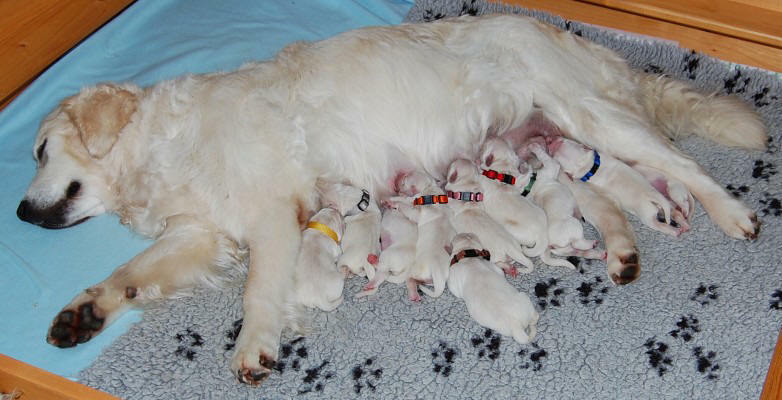 Puppies grow fast mummy Rory takes great care about them. Rory has enough milk for babies. 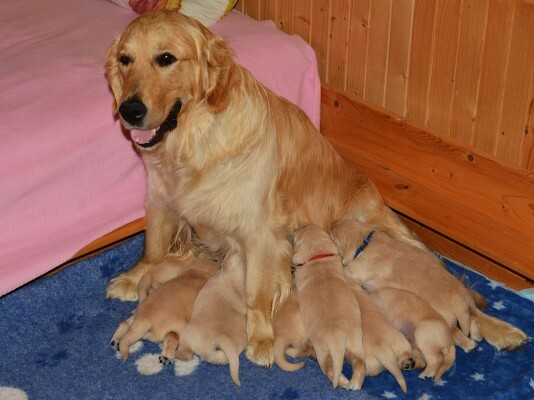 We try to help a bit with milk from bottle but puppies are not much interested. Puppies can see and hear now and train making different sounds and movement. They can make few steps right now but improve very quickly. 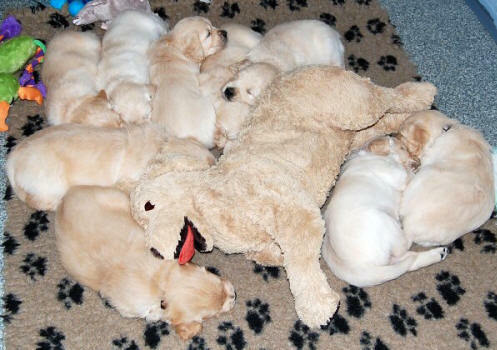 Puppies also start to explore their surrounding - toys, siblings and mummy. They also got their first deworming. Our progeny was doing great at International Dog Show in Litoměřice. Pino - Power of Love Brdské zlato was Excellent 2. place in open class. 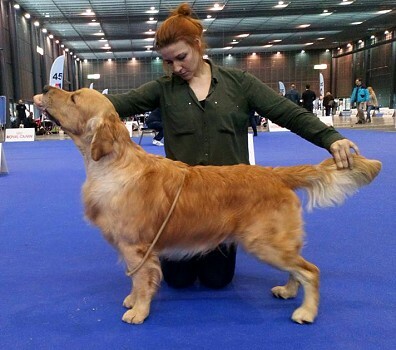 Molly - Run And Play Brdské zlato won open class with CAC title and then added also r.CACIB title! Big congratulations! 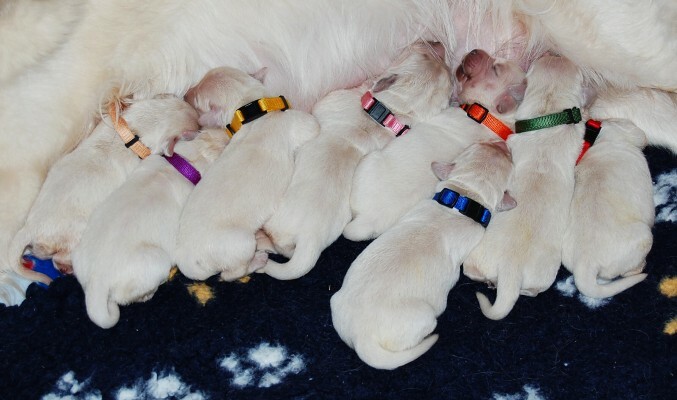 "Puppies" from our Litter Crazy celebrates their 11. Birthdays. We wish to all of them many more healthy years with their owners and happy Birthday party with a lot of good food and many gifts! We remember our sweet Cori who´s waiting for us over the rainbow bridge. 14.5.2018 - Our Puppies are just one week old today. 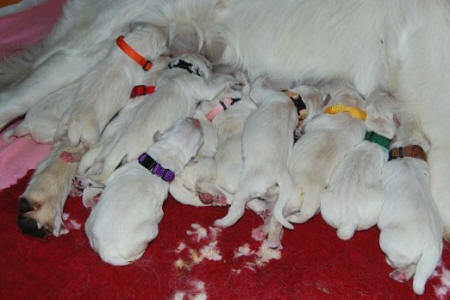 All doubled their birth weights and biggest ones weights over 1kg. Rory - Run and Retrieve Brdské zlato "U" takes perfect care about them so we don´t have much work so far. We´re looking forward puppies will open eyes in few days. Some of our progeny were at double club show in Humpolec this weekend. Eris - JCH Power of Sol Brdské zlato has no coat after her first litter yet so she was VG and Excellent 3. place in working class with nice critics. Sarah - DualCH Deep Desire Brdské zlato "U" was too fluffy and strong for judges so she got 2x VG in veterans class. Her brother Dean - CH CZ, PL & SK, VetCH SK & PL Deep Devotion Brdské zlato won veterans class with Excellent 1 on Saturday and was Excellent 4. place on Sunday. Big congratulations to everybody! 11.5.2018 - Our Litter U is 4 days old and grows very quickly. 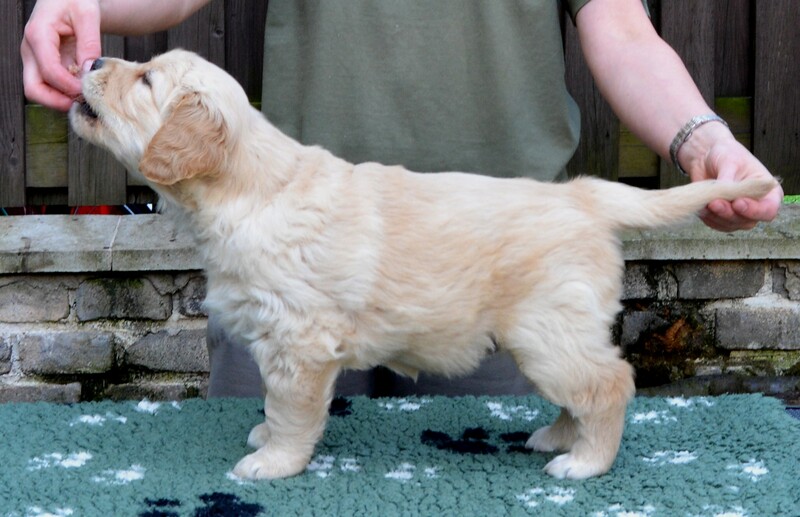 All puppies are over 700g now and all nearly the same weight. There is peace and harmony in whelping box and we enjoy little ones very much. Puppies´s coats are getting darker and their noses and paws are nearly all black now. 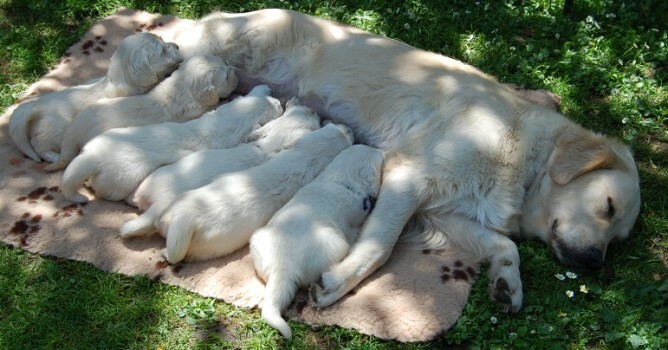 Puppies only sleep and drink mummy´s milk but can be also loud if something is wrong. Rory - Run and Retrieve Brdské zlato "U" takes perfect care about her big family. She spends all the time with her babies but enjoys nice little walks on meadows with other girls. 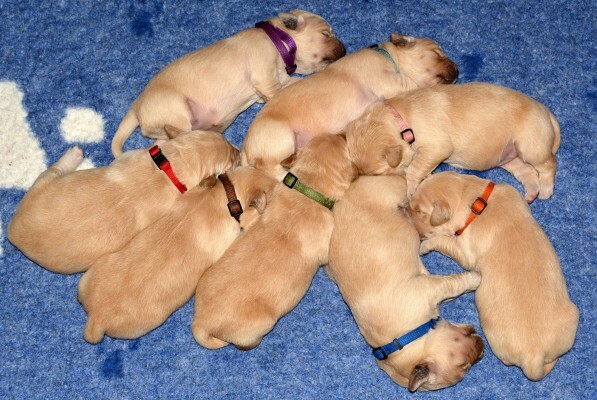 We started Early neurostimulation today to give to puppies the best start in their lifes. 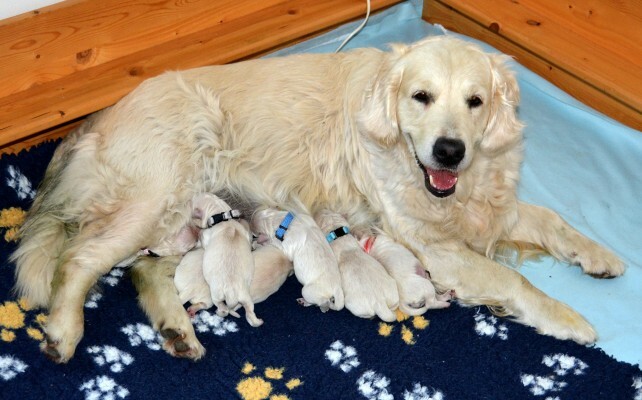 Our Litter Northern celebrated 5. birthday the same day when our new babies were born - 7.5. We wish to all darlings from Northern litter happy birthday and long life in full health with their families! Next news are from Belgium. 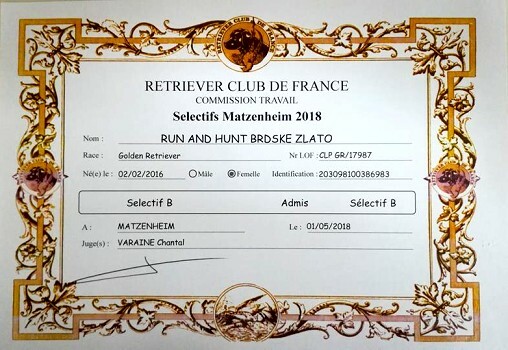 Leeloo - Run And Hunt Brdské zlato and her owner Roland are great team and passed Selective B together. Now they are aproved to attend FTR. Big congratulations! Last news are fom show rings. 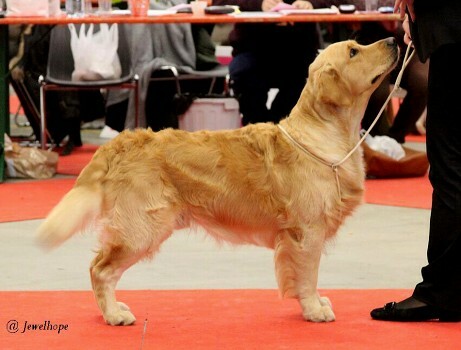 Our progeny was doing great at International dog show in Prague. 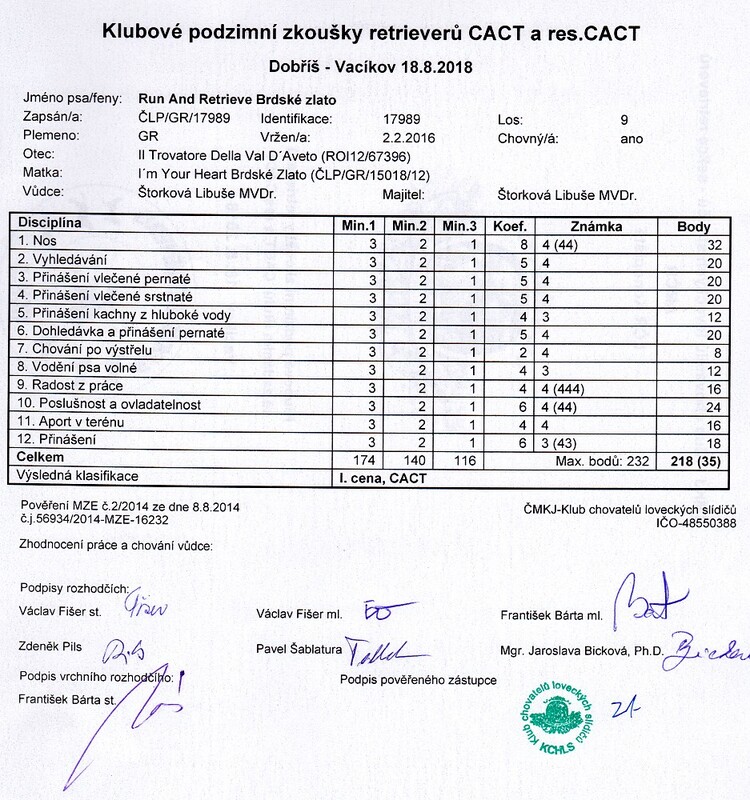 Pino - Power of Love Brdské zlato gained 2. place and r.CAC in open class, Dean - CH CZ, PL & SK, VetCH SK Deep Devotion Brdské zlato Excellent 3. in veterans class and Molly - Run And Play Brdské zlato Excellent 4. place in strong open class. Lola - Let Me Love You Brdské zlato was Excellent 2. in open class in Finland. Congratulations to everybody! 7.5.2018 - Rory - Run and Retrieve Brdské zlato "U" and CH Van Dave of High Hopes became proud parents of 8 puppies today. We have 4 boys and 4 girls. Birth weights are balanced 480-410g (boys a bit more and girls a bit less as it should be :o)). Also colours are balanced - nearly the same as mummy. Puppies have very nice pigmentation and all are very lively and sucking immediately. Rory was perfect during all delivery and managed all by herself. I was needed only to hold her paw :o) Rory takes pefect care of her babies, already ate well and run around our garden - happy she has no big belly to retard her any more. Now we rest and sleep after sleepless night. 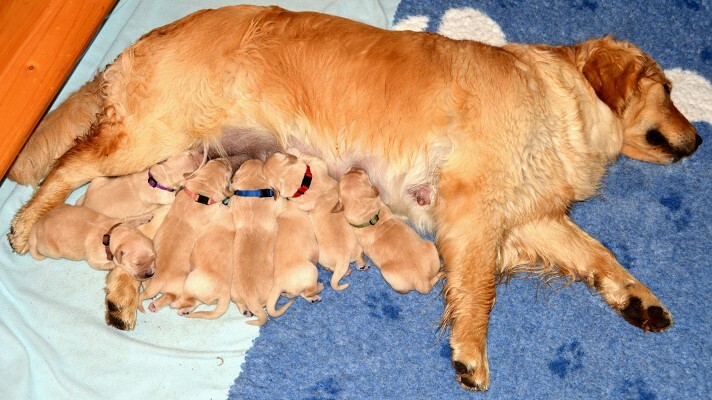 Here are first pictures of puppies from deivery. 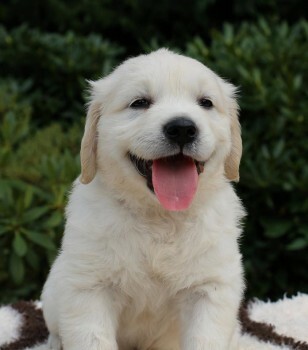 All puppies are already reserved. Ultrasound confirmed we can look forward to our next litter in May. 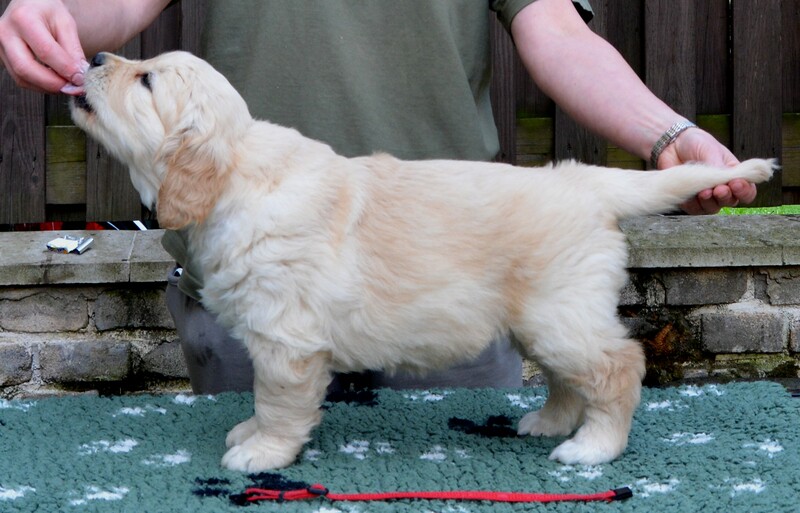 Rory - Run and Retrieve Brdské zlato "U" is in whelp with lovely CH Van Dave of High Hopes. We are very happy. We don´t take reservations for girls any more only for boys. We´re back home from our mating trip to Switzerland. 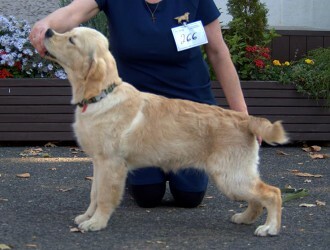 Rory - Run and Retrieve Brdské zlato "U" was mated with CH Van Dave of High Hopes on 7.3. Mating was perfect so we hope to see puppies in ultrasound after 3 weeks. Many thanks to my friend Irena who was again wonderfull companion during our traveling and also to Claudia and Mario, it was such pleasure to meet you! 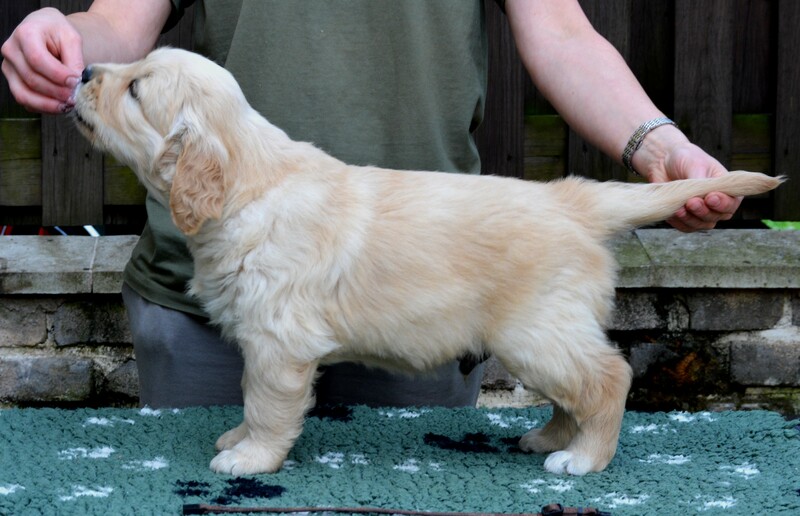 Puppies expects kennel Golden Elianne from Pino - Power of Love Brdské zlato and Dorotka - Quantum of Gold Brdské zlato. 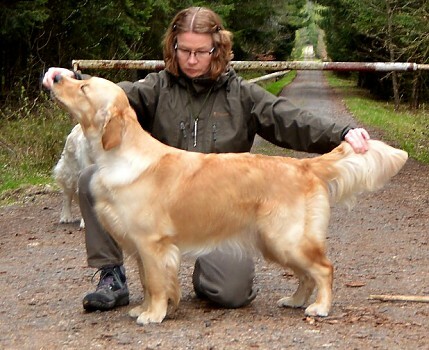 Pregnancy is confirmed by ultrasound and we´re looking forward to see this rich golden color litter soon! 3.3.2018 - Puppies from our Litter Let celebrate their 6. Birthday today! We wish too all our sweethearts many more happy and healthy years with their families! Argo, Rommi, Dasty, Tobby, Bady, Elsa, Lola, Flo and Kira we love you all! 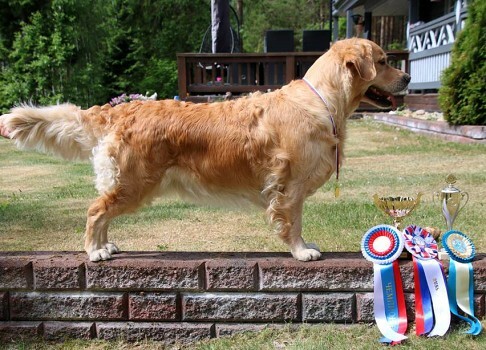 Our progeny was doing great at Double International Dog Show in Brno. Pino - Power of Love Brdské zlato was Excellent and Excellent 2. place with r.CAC. Molly - Run And Play Brdské zlato Excellent 4. place and Excellent 3. place and Finny - Quantum of Joy Brdské zlato "U" 2x Excellent. Congratulations! 2.2.2018 - our loved Rory - Run and Retrieve Brdské zlato "U" celebrates her second Birthday today as well as all darlings from Litter Run! We wish you excellent health and many more Birthday parties with your families! Our Lola - CH Let Me Love You Brdské zlato had wonderfull show weekend in St. Peterburg. She won both days open class and gained 2x CC and 2x BOB titles! Big congratulations! We enjoyes our "Golden walk" with our progeny a lot on Saturday. There were really many people and dogs this year and some didn´t hasitate to arrive also from abroad. We had very nice day. Many thanks to everybody! 24.1.2018 Our Rory - Run and Retrieve Brdské zlato "U" passed her first eyes check. We are very happy that she passed with flying colour and her eyes are Clear! 21.1. 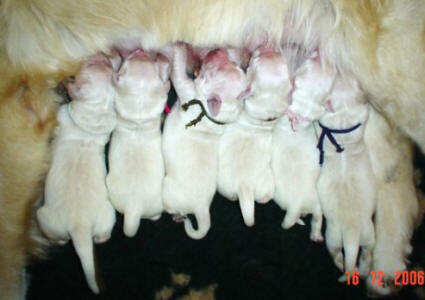 - Our Litter Make celebrate 5. Birthday today! We wish to all sisters and one brother happy birthdays party, and long healthy life with their families! 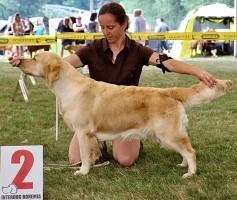 First news in this year are show results of our progeny from National dog show in Brno. Pino - Power of Love Brdské zlato gained Excellent, 2. place and r.CAC title. Girls Molly - Run And Play Brdské zlato and Noreen - Northern Star Brdské zlato both Excellent. Big congratulations!